Corker was the Big-8 Defensive Player of the Year in 1978, impressing with his combination of speed and size, although he suffered torn ligaments in his knee during the season. He came back to receive second-team all-conference recognition in ’79 and was chosen by the Houston Oilers in the fifth round of the 1980 NFL draft but, after three undistinguished and injury-plagued years, was let go following the 1982 season. 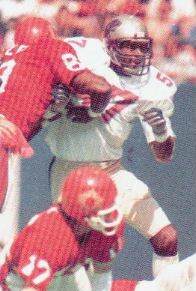 Corker was signed by the Panthers of the new USFL, who obtained his rights from the Washington Federals. Panthers went 12-6 to finish first in the USFL Central Division while leading the league in sacks (74). Won Semifinal playoff over Oakland Invaders (37-21) & USFL Championship over Philadelphia Stars (24-22). Corker followed up his sensational 1983 season with a lesser, if still effective, performance, registering 8 sacks and 76 tackles over the course of 14 games in ’84 and receiving All-USFL honors from The Sporting News. He was left unprotected when the Panthers merged with the Oakland Invaders in 1985 and joined the Memphis Showboats. Adding another 5.5 sacks, he finished his USFL career with 41.5. With the demise of the USFL, Corker attempted a return to the NFL but failed to catch on, at least partly due to off-field drug use. He joined the Detroit Drive of the Arena Football League in 1988, performed well on offense as well as defense, and returned to the NFL with Green Bay, appearing in two games. Corker returned to the arena league in 1990 and spent another six seasons with the Detroit Drive and Miami Hooters. He was named to the Arena Football League’s 10th Anniversary All-Time team as an offensive and defensive lineman and was inducted into the league’s Hall of Fame in 2002.